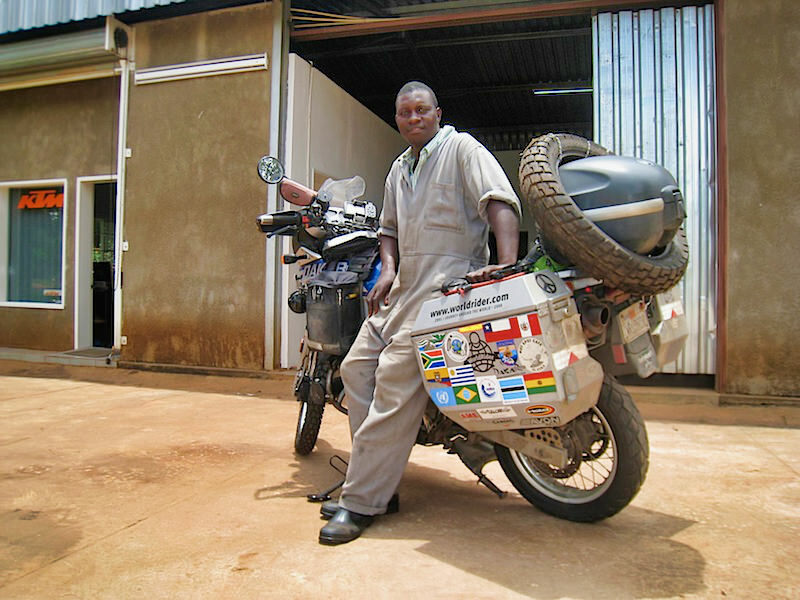 You are here: Home / Africa / Zambia / What’s That Oil Leak On My Brake? What’s That Oil Leak On My Brake? With the rain still pouring on Lusaka I contemplated my plans. Ronnie, the South African I rode through the Caprivi, into Botswana and through the Zambian border was staying with friends in Lilongwe and on Lake Malawi. With a plan to get to Dar Es Salaam and then ride back to South Africa through Mozambique, I considered connecting with him again for the ride into Dar. Not ready to jump on the bike after my one night, I booked another night in a private room and began sorting through my plans. 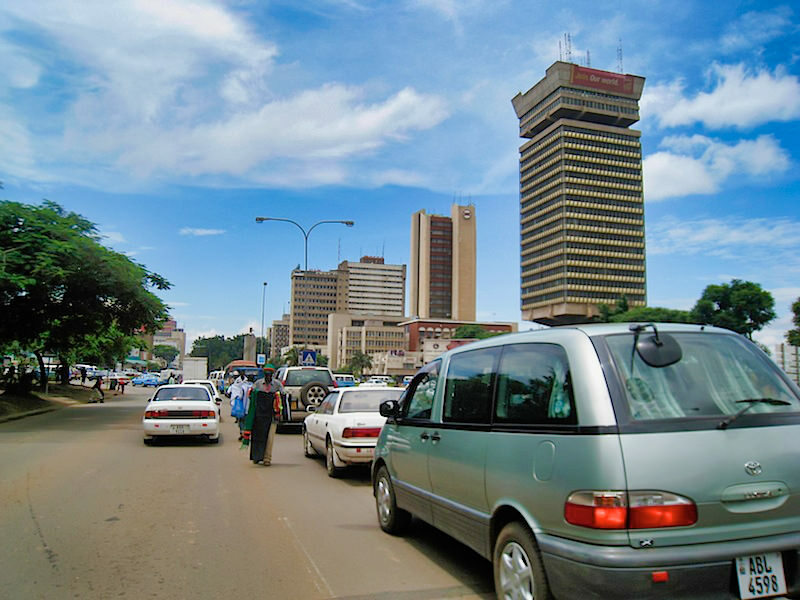 Downtown Lusaka, Zambia – traffic. One of my PIAA auxiliary lights had burned out. Lusaka would be perhaps the only place I could find a 35w H2 halogen bulb. But venturing to nearly every auto/moto parts store in town I found plenty of 100w bulbs and one 50w. Using 50w in those lights could compromise the electrical system. The generator on the Dakar is measly and not well-suited for lots of electrical accessories. I remember in Alaska when temperatures dropped to the point I needed the heat from the heated grips and my electric vest and while cruising a road requiring slow speeds and low RPMs just a few minutes waiting by the side of the road with engine off but ignition on, i didn’t have enough juice to start the engine and required a push start. Not that I envision needing heated grips or my heated vest in Africa, I don’t want to risk battery failure. I bought the bulb but just keeping it as a spare. Perhaps in Dar I can find a 35w bulb. At one of the stores the owner joined me in the parking lot to check out Doc. That’s when we noticed oil dripping from the front brake caliper assembly. He thought the brake fluid was leaking but after quick inspection I figured it was the fork seal. I cleaned up the oil from forks, brake unit and tire and rode a few miles and then another inspection. Yep. Seems like the left fork seal is blown. And the amount of fluid dripping on the brake made my front brake rather ineffective. Must have been one pot hole too many. I wasn’t prepared for this. At least I didn’t think so. I shot SMS messages to my friend Hedley at BMW in Windhoek and to Wes in Cape Town just to get some second opinion on what ramifications I’d experience if riding with a leaky seal and low fluid. But perhaps most concerning was the problem of oil running down the fork and onto my brake pads. After pulling out all of my spare parts from the dummy Adventure Pipe exhaust stash tube I found that I did by a second set of fork seals. After Doc sat for eight months at 13,000 feet in the dry harsh climate of the Bolivian Altiplano, the seals had deteriorated and I had to use my original spare of seals. But before returning to Bolivia thankfully I had the wisdom to order a second set. Loosening those seals takes a bit of effort! I didn’t look forward to changing the seals myself. So I set out to find someone in Lusaka I could trust and who could quickly help me solve this problem so I could move on to Malawi. 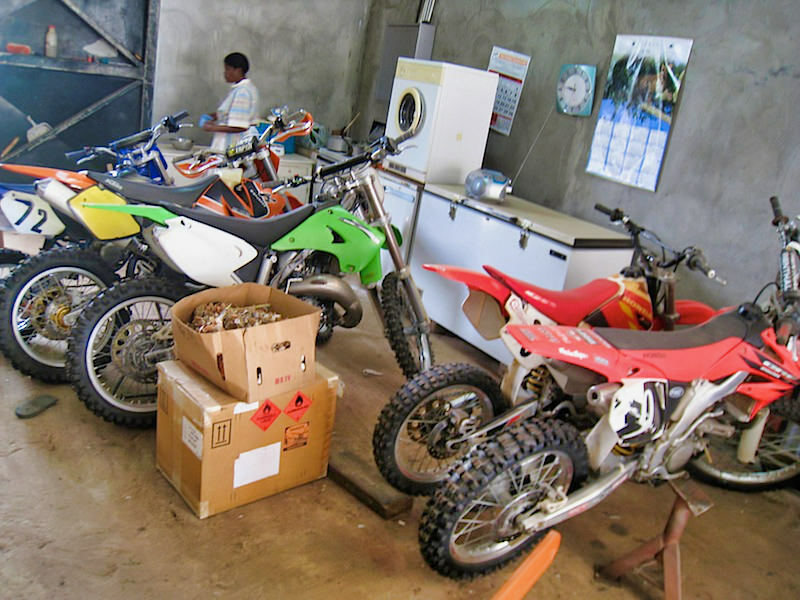 I was referred to Ray Wilson who owns the only KTM dealer in Zambia — but it’s not his first line of business. After several phone calls and a brief meeting the next morning I followed his directions to the workshop. There is no store front and the workshop and retail room is actually on his residential property. I learned the Ewan McGregor and Charley Boorman stopped through here on their “Long Way Down” journey the year before. But to find the store and workshop you need an appointment. The GPS coordinates are S 15.30.749 E 028.16.237 and you can reach Ray at 260-(0)966-766915 – Wilson Off-Road Works – KTM Dealer Lusaka, Zambia. Dressed in overalls and with a serious demeanor, Charles opened the doors to the workshop and I rode Doc inside. He had been working on the suspension of a Honda CRF250 and there were a few odd Japanese bikes and one KTM. Charles doesn’t ride motorcycles. But he loves working on them. In a couple hours we had the seals replaced. Meanwhile I noticed in the back-room a couple of tires that mysteriously looked like that might be the perfect size for Doc: a 21-inch 90/90 and a 17-inch 130/80. They were Dunlop TrailMax’s. I never seen nor heard of these before but the tread pattern and composition were clearly designed for dual-sport riding. I hoped to make it to Nairobi on my current tires as all information pointed to Kenya’s capital city as the only place north of Windhoek I’d find tires for my bike. But given that traveling through Kenya due to the political situation was questionable. This was magic luck. I bought the tires. 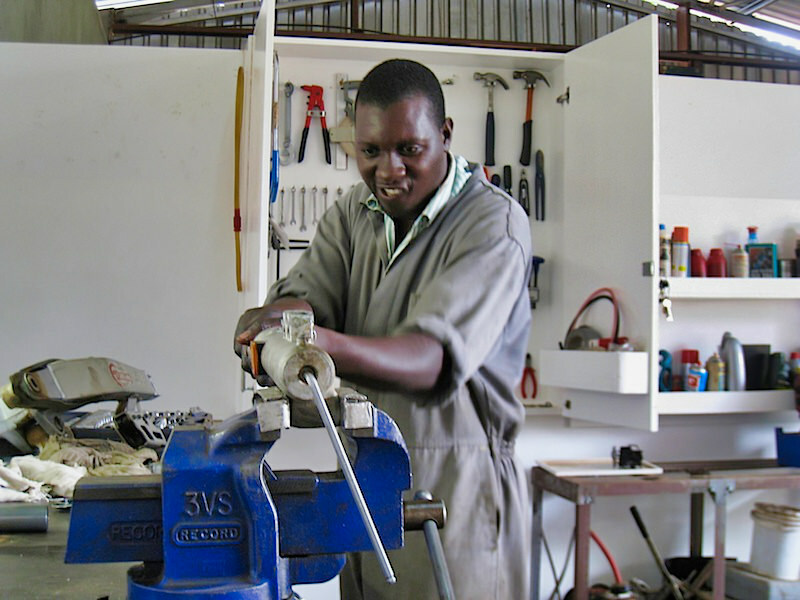 Charles from Ray Wilson Off-Road Works in Lusaka, Zambia helped replace my fork seals, install a new front tire and set me on my way. I was still riding with an Avon Gripster on the front which was new in Rio de Janeiro some 11,000 miles ago. The rear had about 4,500 miles on it and was clearly showing signs of wear, but not quite ready to be replaced. In fact the Avon on front had more tread, but since we had the tire off the bike I opted to just replace it now considering front tires will last 2 to 1 to the rear. As for the new rear, I decided that I should bleed as much wear out of the Bridgestone before replacing it as finding another tire “in stock” anywhere north would be next to impossible. So I finally found a use for the spare set of bungee cords I had purchased in South Africa in November. I secured the spare rear tire to the back of the bike and returned to ChaChaCha Backpackers for final preparation for an early morning departure. https://i0.wp.com/www.worldrider.com/wp-content/uploads/2014/08/IMG_6754-tm1.jpg?fit=600%2C450 450 600 allan https://www.worldrider.com/wp-content/uploads/2014/08/worldrider_logo_white_border-trans1.png allan2008-01-28 01:23:472008-01-28 01:23:47What's That Oil Leak On My Brake? Going To Lusaka Some Days Are Best Forgotten.